The caption says, “A white swan (lat. 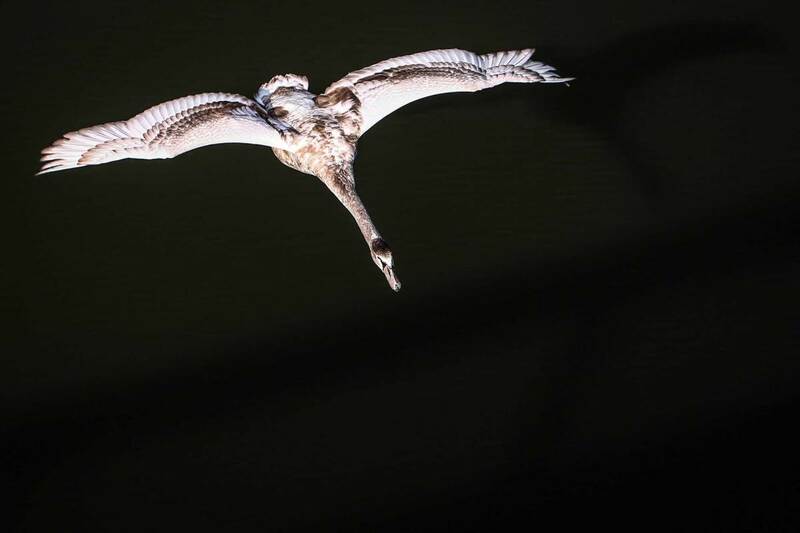 Cygnus olor) flies over the Main-Donau canal in Bamberg, Germany, 06 October 2014.” Not that you can see the canal, or Bamberg, or the sky, or anything except the bird suspended in a black void. Nor are the feathers pure white, which you can see in the stock photos that will pop up on Google Image. The bird seems to have been stained by mists of oblivion, as if it were a message traveling through some fantastic system of communication in Middle Earth. Such fantasies may be invited by the stark contrast of the lighted figure and dark background, which makes the bird seem to be a silhouette despite still being visible as a specific individual. The image is both the literal trace of a single animal in a single moment of time, and an abstraction in some undefined cognitive space. There once was a bird passing over a canal, and there is the Swan, a Bird, token of Nature, passing through Life, again and again and again. Many people spend their entire lives seeing swans without ever seeing a swan. From the preschoolers’ first picture books to Disney movies to advertising to the arts and back again, swans are not rare birds. They are tokens of culture, not a familiar part of nature. One might hesitate then about focusing on photography alone, but the image above does provide an object lesson in photographic seeing. Joel Synder has pointed out that cameras don’t capture images–they make them. The image doesn’t exist until the camera clicks. The image above is a near-perfect demonstration of that distinction. There never was a swan suspended against a black background; those effects were created by the camera. In fact, a swan was flying through a night sky, but the movement has been stopped and the details of the actual optical field have been abstracted out of the picture. And a similar transformation is true of every swan photograph that you have ever seen. Those swans never existed in the rectangular box of the photograph; they are found there only in the image. Of course, as we have become habituated to photography, we also become accustomed to projecting images: to imagining how photographs could be taken and how scenes are more or less photogenic. We also become accustomed to collecting images: to filling our phones and tablets and heads with expansive vistas, glorious sunsets, and thousands of small ornaments: raindrops on a leaf, leaves on the surface of a pond, the moon reflected in the dark water. Now that is a serious charge, and although Sontag offers no proof whatsoever, it would seem to be supported by Synder’s account of the image. That silhouetted swan is pure culture, and although the photograph promises to bring you closer to nature, in fact you only are being brought close to an optical illusion. The photo says, “Look, you can see a bird that you never would have seen otherwise,” but you still haven’t seen that bird as it actually moved through a material environment, much less while you were a part of that same environment. But you have seen something, and something that was amazing, and what you would not have seen otherwise. In that seeing, you have become part of a larger world, and one in which the most ordinary and distant and ephemeral of events–a bird flying across a canal–has acquired special significance. Not meaning, perhaps, but significance, which may be all that we can hope for some of the time. (Some readers may hear an echo of Walter Benjamin’s remark that Kafka “sacrificed truth for the sake of clinging to its transmissibility.”) Photography does transmute reality into images, but to create a common world, which now is one where a swan flies through complete darkness, like a message from a distant beacon. Photograph by David Ebener/EPA. Joel Synder’s argument is set out in “Picturing Vision,” Critical Inquiry 6 (1980): 499-526. Sontag’s remarks are from On Photography, pp. 85 and 97. Walter Benjamin’s insight is in Illuminations, p.1 44. For an earlier post on this theme, go here.